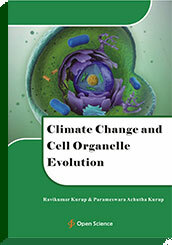 Climate change leads to alteration in cell structure and evolution of new cellular organelle. Global warming induces endosymbiotic archaeal and RNA viroidal growth. The primitive archaeal DNA is integrated along with RNA viroids which are converted to their corresponding DNA by the action of redox stress induced HERV reverse transcriptase into the human genome by the redox stress induced HERV integrase. The integrated endogenous genomic archaeal sequences can get expressed in the presence of redox stress forming endosymbiotic archaeal particles which can function as a new organelle called the archaeaons. The archaeaon can express the fructolytic pathway constituting an organelle called the fructosome, cholesterol catabolic pathway and digoxin synthetic forming an organelle called the steroidelle, the shikimic acid pathway forming an organelle called the neurotransminoid, antioxidant vitamin E and vitamin C synthetic organelle called the vitaminocyte as well as the glycosaminoglycan synthetic organelle called glycosaminoglycoid. The archaea can secrete capsulated RNA viroidal particles which can function as blocking RNAs modulating cell metabolism and such archaeaon organelle are called viroidelle. The archaeaon concerned with GABA shunt pathway and porphyrinogenesis are called porphyrinoids. Climate change leads to a new cell structure and new cellular organelle evolution.